Acetal Homopolymer is also know under the following trade or brand names Delrin, Tecaform, Ultraform, Celcon. 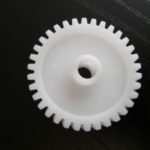 As well as Acetal brand names it also know as the following industrial names including polyacetal, polyoxymethylene (POM), which is a high performance engineering polymer. 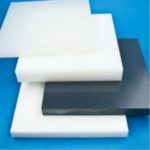 Acetal is available as a homopolymer (POM-H) or copolymer (POM-C). Homopolymers have a increased degree of regularity in their makeup; therefore they are more crystalline than their copolymer alternatives. The other monomer used to make the copolymers has a longer hydrocarbon linkage that increases the spacing between the oxygen atoms in the polymer chain. These oxygen atoms are the points of greatest susceptibility for thermal and oxidative degradation, so the fewer of these that are present, the more resistant the material will be to degradation.